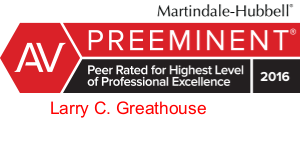 Larry Greathouse is a Partner at Gallagher Sharp and is active in the General Litigation and Insurance Practice Groups. He has served as trial counsel in numerous cases involving a wide variety of issues, including negligence, insurance coverage, bad faith, professional liability, building construction, and breach of contract. He has been selected as an arbitrator/mediator by courts and private parties, and has served as legal counsel in well over 100 trials, mediations and arbitrations. He has served as legal counsel in approximately 30 reported appellate decisions.